If you have checked our publication Testing the AMD Radeon RX 480 for Ethereum Mining you should already know that at the moment you are a bit limited in your capabilities of reducing the power usage of the new RX 480 GPUs. The pretty much only way to lower the power usage for mining Ethereum with Radeon RX 480 is to use the Power Target reducing it below the 100% value (150W TDP) and thus forcing the GPU to lower its operating voltage and frequency in order to still fit in the allowed TDP. Using a lower operating frequency and voltage for the GPU with the power limiter set at the right value should lower the power consumption, but not change the performance you get while mining Ethereum. Further lowering it below that optimum spot and you will start seeing a drop in mining performance, so our goal here was to find the sweet spot where the hashrate will not be affected. We have started with the default settings of the RX 480 for both the GPU (1266 MHz) and the VRAM (8000 MHz) and started lowering the Power Target slider until we have reached the 83% – the value at which the power is getting reduced, but the hashrate remains the same. Going below 83% percent of the 150W TDP started lowering the hashrate below the regular value at 100% power. The result was 149 Watt drawn at the wall, taking in consideration the PSU power efficiency that should be about 130W actual power usage. This is down from 177W at the wall with default settings with pretty much the hashrate unaffected and the temperature also went down from 68 to about 60 degrees Celsius. Repeating the same procedure as above, but with the video memory set at 9000 MHz and the Power Target set a bit higher at 85% we saw a very slight decrease in performance with just about 5W extra power usage at the wall (155W). The performance we got with this setting was about 27.8-27.9 MHS and the operating temperature was down from about 72 degrees to about 63 degrees Celsius, so definitely a good improvement. For the moment the only way to reduce the power usage without a drop in performance is by lowering the TDP limit under the default value of 100% and you can easily reduce the power consumption with something like 30 Watt at the wall (if using 80 Plus Gold PSU). You can experiment by further reducing the power target slider under these recommended values, however with the additional power savings you should also start noticing reduction of the hashrate you are getting. Still if you are looking for optimal efficiency you might try going lower and if you already have Radeon RX 480 and use it for Ethereum mining you are welcome to share your settings in the comments below. 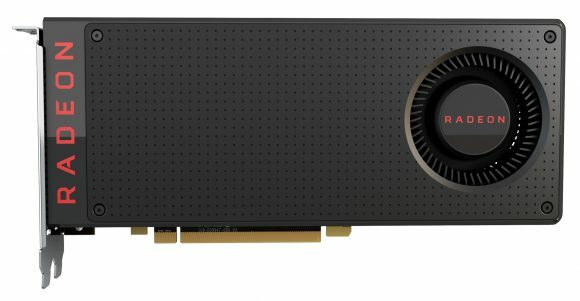 The new AMD Radeon RX 480 is now officially out and we have some results from tests we have actually performed ourselves, results that pretty much confirm an earlier leak that was posted about the expected hashrate. 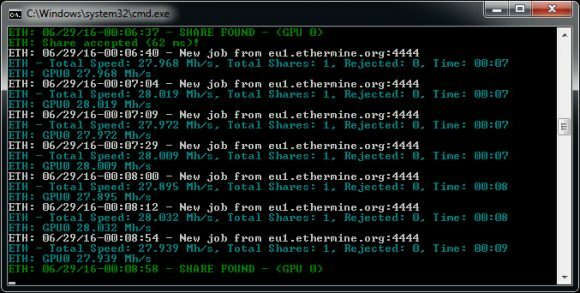 As you will see the number of tested algorithms is only one – Ethereum’s Ethash as it seems that there are some problems at the moment running sgminer with most algorithms on RX 480… could be a driver issue, could be something else. Anyway, we are sure that most of you are interested in the Ethereum hashrate that the RX 480 is able to deliver and we have information about that. The hashrate for Ethereum mining that thr Radeon RX 480 delivers is good, though the power level is not that great, the cooling of the reference design RX 480 is also not that great for mining and the price is also not what some people in some regions expected and on top on shortages, though in many places you can buy the card at the price that AMD announced or close to it and there are enough cards. Before we move to the tests we should note that there are two variants of the Radeon RX 480, one with 4GB video memory that apparently runs at 7 GHz and is with a lower price (the $199 USD price) and a more expensive 8GB model with memory running at 8 GHz. At launch it is hard to find 4GB versions as apparently they are much fewer as compared to the 8GB models, but if you are buying a card for mining the 8GB model is the one you would want. We have tested an ASUS reference design Radeon RX 480 card with 8GB and 8 GHz video memory, so the results below are for mining Ethereum with that card. The 4GB model with 7 GHz video memory should be slower by about 2-3 MHs compared to the 8GB 8 GHz version, so if you are buying these for mining Ethereum go for the 8 GB models. We are using Claymore’s Dual Miner, starting with the default settings of 1266 MHz for the GPU and 8 GHz for the video memory withing the standard 150W TDP limit of the Radeon RX 480 GPU. The result we are getting is about 24.7-24.8 MHS at stock settings with GPU-Z reported power usage of about 108 W, but with actual power usage measured at the wall of 177 Watt. So taking into account the power conversion efficiency of an 80 Plus Gold PSU that was used the actual power usage of the card is apparently 150W at the default settings. This is further confirmed by the fact that while mining Ethereum with the default settings the GPU frequency hovers up to about 1240 MHz and does not go all the way up to 1266 MHz. Essentially hitting the power limit of 150W that the card has, increasing a bit the power limiter by a few percent over the default 100% allows the GPU to stay at the full 1266 MHz… not that it makes any difference for mining Ethereum, but it could be important for other not so video memory intensive crypto algorithms. With dual mining mode enabled to mine both Ethereum and Decred at the same time the results show about 24.3 MHS for Ethereum and about 365 MHS for Decred (at default intensity of 30). Further increasing the Decred intensity to 35 decreased the Ethereum hashrate to about 24 MHS and increases the Decred mining hashrate to about 450 MHS. So essentially the RX 480 does pretty well in dual mining mode with not so much of a drop in the Ethereum hashrate while providing some good extra performance for mining Decred. 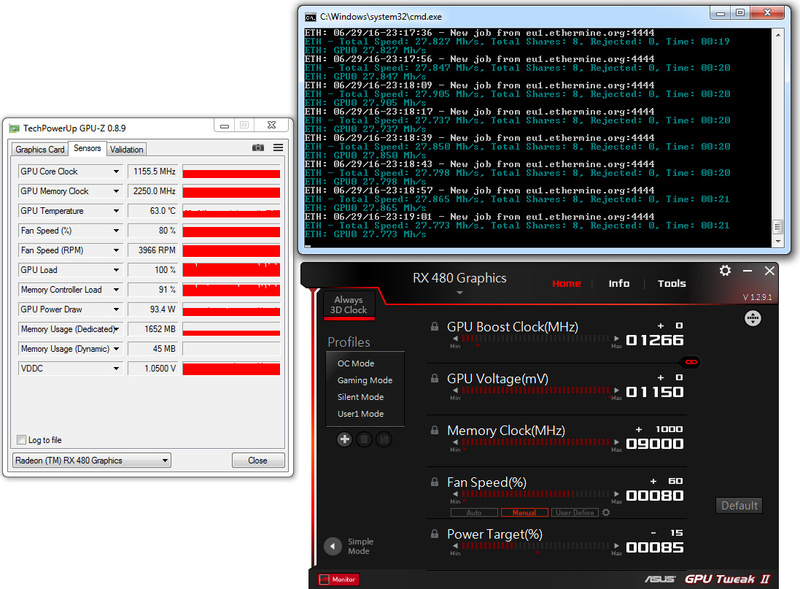 Moving to overclocking, the only thing we need to do is increase the video memory to the maximum and in this case this means 9 GHz (the card might be able to handle more, but the overclocking software or the driver is apparently capped at 9 GHz max). 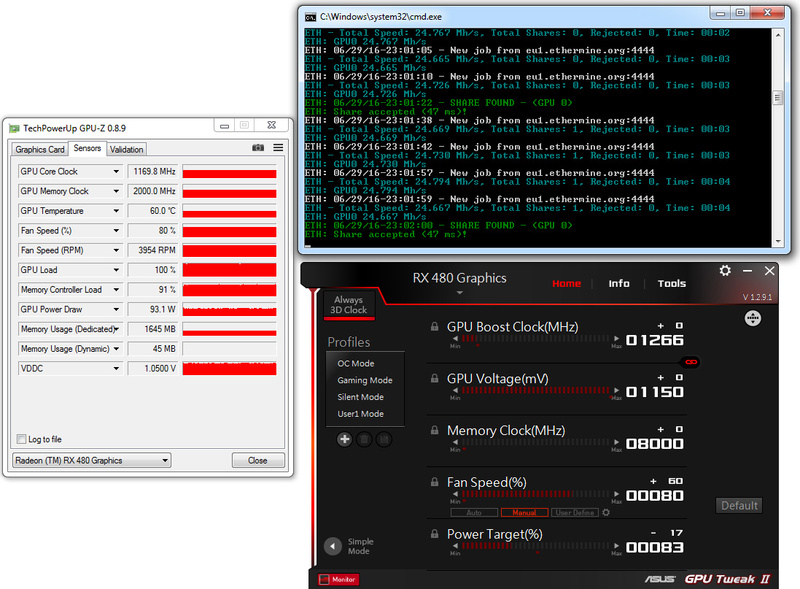 With the video memory at 9 GHz the RX 480 is capable of delivering about 28 MHS hashrate for mining Ethereum. It is highly possible that even higher hashrate could be achieved if you manage to get past the 9 GHz limit for the video memory, but for the moment AMD’s WattMan software or the Asus tool that we used do not currently allow for more. With the memory overclocked the power usage is increased with just about 7-8 Watt at the wall, so definitely worth overclocking it for mining Ethereum. We were a bit disappointed by the lack of overclockability headroom of the GPU that was able to get just about 1340 MHz with the stock voltage. Of course no point in overclocking it for Ethereum mining, in fact you might want to actually downclock it to get better power efficiency if mining only Ethereum. What we are not too happy with is the stock cooling solution and how it handles the heat from the RX 480. AMD has optimized the default profile for the fan to keep the card silent and very hot, so obviously it is a no go for mining. What seems to work pretty well is setting up the fan to about 80% and getting decent temperatures with a moderately noisy card – good choice if noise from the mining rig can be an issue. With the cooling fan at 80% you can expect temperatures of about 72 degrees Celsius for the GPU, something that is a bit higher than you’d probably want for 24/7 mining. Going for 100% fan the noise increases significantly and the temperatures drops to about 68 degrees Celsius, so not by much. We are not too happy with the power usage and the hashrate you get from the RX 480 for mining Ethereum, we kind of expected better results in that area. But then again by lowering the GPU operating voltage and frequency you might be able to get better power efficiency without actually loosing any performance and this is a must if you are mining Ethereum… that is if you are actually able to downclock the GPU, a modified video BIOS with the right settings might be a good solution to that problem, but that would also need some time. We are going to be doing some more tests to see if things with the sgminer crashing on most algorithms and looking for other options to improve the power usage when mining Ethereum etc., so stay tuned for more info about the RX 480. For the moment however we are not very impressed by the new AMD Radeon RX 480, though a non-reference design with some extra tweaking might be able to change our opinion.